The SureColor Solvent 60600 is intended to deliver strong amazing signage rapidly, effectively and at least cost. It suits an organized work process environment with medium to high creation volumes. It can be utilized with an extensive variety of media including paper, canvas, film, and vinyl. It suits an extensive variety of utilizations including indoor POS and open air signage, illuminated showcases and window enrichments, pennants, vehicle wraps, backdrops, surface completions, and marks. Epson SureColor SC-S60600 - 64" joins Epson's most recent PrecisionCore print head and UltraChrome Eco-Solvent ink innovation. It produces prints that are brighter and glossier than at any other time with a more extensive shading extent. It produces quality item utilizing lower pass rates and less ink with the less complex arrangement, simpler operation, and quicker occupation culmination. Prints dry speedier and machines require less client upkeep. Ink has a low smell to empower operation in an extensive variety of business, business and office situations. 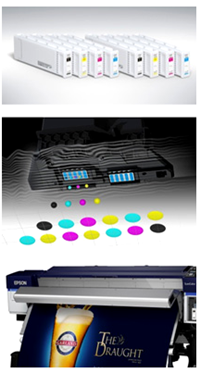 The SC-S60600 joins Epson's most recent PrecisionCore printheads. The heads utilize Variable Sized Dot Technology (VSDT) to empower drops as little as 4.2pl for smooth shading degree with ideal ink application. While contending head advances utilize warmth to shape beads, Epson utilizes a protected MicroPeizo operation that is kinder on the ink for predominant shading exactness while additionally empowering augmented head toughness. The heads are driven by Epson Precision Dot Technology with an updated LUT and overhauled Half Tone Module for pictures with the higher difference and diminished grain. Another Control Dashboard application gives access to a library of improved settings for regular media sorts while new print modes furnish predominant outcomes with unique and custom substrates. ** Additional new MicroWeave designs empower yield with higher consistency and diminished banding at lower pass rates.